Here is simple Electronic Circuit Project of metal locator circuit; the metal locator uses a one-transistor oscillator and an AM radio to detect metal. Transistor Ql is a pnp transistor that is connected to an oscillator. 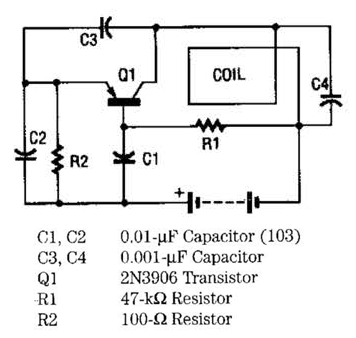 Resistor Rl provides the correct base bias and capacitors C3 and 04 and the search coil determine the frequency of oscillation. Capacitors C3 and C4 are fixed in value, but the search coil is an inductor that varies in inductance (and thus varies the oscillator frequency) as metal is brought near it. The oscillator frequency is rich in harmonics and its output falls within the AM broadcast band. The metal detector works by combining its output with the local oscillator of the AM radio. The resulting net output of the radio is a low- frequency audio tone that changesgets higher or loweras metal is brought near or taken away from the search coil. Commercial metal detectors use two oscillators, so they don`t require an AM radio. This metal locator provides an inexpensive alternative to an expensive commercial metal locator.